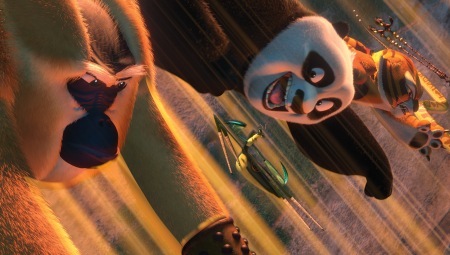 As Kung Fu Panda 2 opens, the dragon warrior Po (voiced by Jack Black) is enjoying success, fame, and camaraderie as a result of the exciting events from the first movie in this series. Yet underneath the excitement, Po suffers from a lack of inner peace - amplified by growing questions about his childhood and his origins. This oversize panda begins to wonder whether the goose cook Mr. Ping (voiced by James Hong) is really his biological father - a fact that is obvious to almost everyone else except Po. And just when our hero begins a journey into the past, another ghost of yesteryear rears his head in the form of the Lord Shen (voiced by Gary Oldman) - a royal peacock who once killed all the pandas of the kingdom when he heard a prophecy that stated one of these animals would ultimately destroy him. Now Shen is back - and once again terrorizes the countryside in a play for ultimate power over all creation. And when trouble arises like this, Po and the Furious Five (voiced by Angelina Jolie, David Cross, Seth Rogan, Jackie Chan, and Lucy Liu) jump into action - but the dragon warrior is weakened when he realizes Shen is somehow connected to his frightening past. And without anything close to inner peace, Po cannot stop this new nemesis and hope seems lost. The events of this film reminded me of the biblical origin stories of Moses from Exodus and Jesus from the Gospel of Matthew. In both these narratives, a royal figure (Pharaoh and Herod the Great, respectively) feels threatened by a prophecy - and resorts to genocide to extinguish any opposition. In Kung Fu Panda 2, Shen joins the ranks of these terrorizing historical figures. In true biblical fashion, the farther one goes to ignore or stifle a prophecy, the farther one actually fulfills the challenging words of a prophet. For anyone seeking greatness in this life, such a realization is understandably troubling... yet to what lengths would we go to respond to it? Moses came from a slave people and Jesus came from Galilee, considered the backwaters of the Jewish countryside. And in this movie, Po comes from the otherwise forgettable panda species, insignificant to the mighty peacocks of ancient China. Greatness truly comes from the least. In our lives, do we seek greatness - like Pharaoh, Herod, or Lord Shen? Do we get jealous of others who gain so much, who get so much praise and honor - when we feel that we deserve it more? At the office, in our families, and among our friends and neighbors, we can fall victim to envy - and even become tempted to destroy the reputations of those who get ahead, perhaps hoping we can slip into their place of honor one day. Jesus tells us, and the prophecies of old tell us, that if we want to be great, we must be the servant of all. We must accept God's will with humility and even tap into our weaknesses if we truly want to be great in this life and especially in the next. Po found "inner peace" when he realized that his humble and frightening origins would not dominate him - but would strengthen him when confronted with trouble. Can we find inner peace, too? Can we be at peace with knowing that others have pushed ahead in the race of life? If we seek peace, then we must embrace our weaknesses, lead with humility, and be open to the will of God in our daily lives. Otherwise, we are a resounding gong - hoping that Jesus' words (and a history of great people emerging from humble origins) can be circumvented by our creativity. But God always has the final word - and this is one principle of the universe that has lasting power. The last shall be first. So it's up to us to take upon ourselves the mantle of being last ... when we do that, we shall achieve inner peace and in that, truly become the greatest in the kingdom.